When we think of portraiture in the “New World,” we usually tend to think of John Singleton Copley and Charles Willson Peale in the US. However, there was a thriving artistic milieu in the Spanish colonies in the western hemisphere long before these artists arrived on the scene. In many ways, Spanish colonial art was more closely linked to European art in spirit, primarily because most Spanish colonists in the New World tended to think of themselves as transplanted Europeans. This distinctly contrasts from Americans who, while respecting their British heritage, were eager to forge their own identity (think American Revolution). By the end of the 17th century, the Viceroyalty of New Spain, centered in Mexico City and extending into Peru and most of South America, had established social customs and orders based on models of European monarchical societies. The social hierarchy of elite classes consisted of (in order of the most honored) families born of European Spanish blood (peninsulares), those of Spanish descent born in the New World (criolles), and those of Spanish descent who had intermarried with native royalty (mestizo). Like the upper classes in Spain, the Peruvian elite delighted in displaying their status through portraiture. 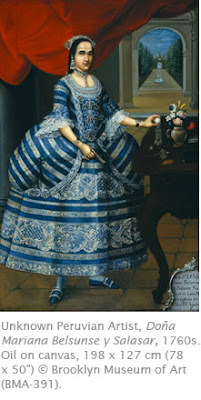 As was the social custom among wealthy families in Europe, Peruvian noble families arranged their children’s marriages, and also controlled which daughters would be sent to a convent. This is a portrait of a young woman whose guardian forced her into a marriage with an elderly count. The story was recounted in Ricardo Palma’s Tradiciones Peruanas. This portrait, produced by an indigenous painter who most likely had native lineage, proves that citizens of Lima had taste in art as sophisticated as their European counterparts. It also shows that the upper classes in colonial Peru were just as eager to prove their status and good taste through art. The young woman, dressed in the height of European fashion, is set in a typical Rococo portrait setting: a pulled back curtain revealing a villa-like backdrop (almost like a stage set), and accoutrements to demonstrate her good taste. The watch she holds symbolizes the passage of time. The table with cabriole legs on which the objects are displayed is the most current fashion from Europe. Connections Across Curriculum - Fine art is just one way to introduce students to the history and culture of colonial America. While students may be familiar with the colonial history of the United States, the impact of the European colonization of South America is probably less known. A number of Spanish colonial writers can shed light on the complex relationship between the imported European lifestyle and the existing traditions and culture of native people, in both North and South America. Visit American Passages – A Literary Survey to find out more about these authors, including Garcilaso de la Vega, the son of a conquistador and Incan princess. Hiya ! Does the rate of your posting depend on specific things or you work on articles when you have a special mood or spare time on that? Waiting forward to hear your answer.